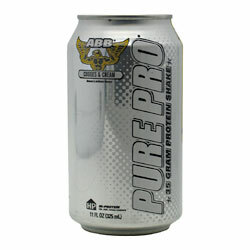 American Bodybuilding Pure Pro Shake 12/11oz On Sale! Premium Protein. Lean Muscle Support. Minimal Sugar &. » Fat. 35 gm of Protein from Milk & Whey. Essential Amino Acids Including BCAAs. 1 gm of Fat. 1 gm of Sugar. Ingredients: Water, Proprietary Protein Blend (Milk Protein Concentrate, Calcium Caseinate, Whey Protein Isolate), Natural and Artificial Flavors, Cellulose Gel, Sucralose, Cellulose Gum, Acesulfame Potassium, Potassium Citrate, Carrageenan. Post-Workout Recovery: Begin drinking one (1) Pure Pro Shake immediately upon completing your workout. Hi-Protein Daily Nutrition: Drink one (1) Pure Pro Shake with or between meals to increase your daily protein intake. As a general rule, consume approximately one (1) gram of protein per pound of bodyweight, per day, split evenly over five (5) to seven (7) meals and supplements. Store in a cool, dry place. For best taste, serve cold. Shake gently before using. Refrigerate after opening.